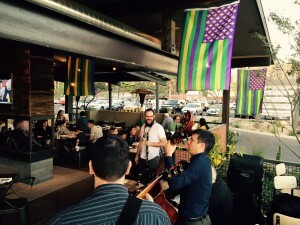 Southern Rail will be bringing a little bit of NOLA to PHX this Fat Tuesday. Mardi Gras merry-making will include $5 King Cake slices, $5 sazerac’s, live jazz from Reid Riddough, lots of beads (no flashing necessary) and, of course, Chef Justin Beckett’s fresh and modern Southern-inspired cuisine, including his famous Jambalaya. Enjoy great food, drinks, music and Southern hospitality. Vive Mardi Gras! At Southern Rail restaurant, Chef Justin Beckett celebrates modern Southern cooking with a rotating menu of seasonal produce, heritage grains, and smoked meats & fish. 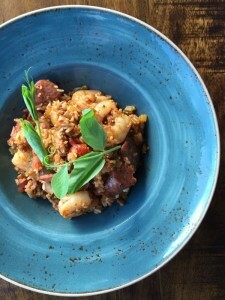 His specialty: flavorful and light versions of the traditional Southern & American dishes he loves. Southern Rail boasts a stylish dining room, expansive outdoor patio, and features a comprehensive bar with an extensive bourbon list and an award-winning wine program. Chef Beckett’s second restaurant is located ‘west of Central,’ in the adaptive reuse project, The Newton (also home to Changing Hands Bookstore and Southwest Gardener), in the heart of North Central Phoenix, and conveniently across the street from the Central/Camelback light rail station. Visit Southern Rail for lunch, dinner and social hour specials daily, and brunch on the weekends, for healthy-ish southern fare in a vibrant community atmosphere. For more information, visit SouthernRailAZ.com.